SANTA MONICA, CA (June 23, 2015) - From the acclaimed team that created the multiple Primetime Emmy® Award-winning and ratings-record-breaking "Hatfields & McCoys" comes HISTORY®'s explosive miniseries Texas Rising, charging onto Blu-ray™ (plus Digital HD) and DVD (plus Digital) on September 1st. HISTORY®'s number one scripted telecast in over two years, the eight-hour epic miniseries premiered to 4.1 million viewers. Texas Rising tells the story of legendary hero Sam Houston and the Republic of Texas's intense struggle for independence against the forces of fierce Mexican General Santa Anna. Spectacularly portraying the story of the most important moment in Texas history, Texas Rising is directed by two-time Academy Award®-nominated director Roland Joffé (Best Director, The Mission,1986; Best Director, The Killing Fields, 1985). The action-packed Western features an all-star cast, including Golden Globe® nominee Bill Paxton (Best Actor in a TV Series, "Big Love," 2010), who himself is a direct descendant of the character he plays, Sam Houston; Brendan Fraser (The Mummy), Ray Liotta (Goodfellas); Jeffrey Dean Morgan (TV's "The Secret Life of Marilyn Monroe"); Thomas Jane (HBO's "Hung"); Olivier Martinez (Unfaithful); Cynthia Addai-Robinson (TV's "Arrow"); Chad Michael Murray (TV's "One Tree Hill") and Max Thieirot (TV's "Bates Motel"). HISTORY® brings to life the thrilling, gut-wrenching and inspiring true story of how the state of Texas fought for their independence from the commanding rule of the Mexican General Santa Anna (Martinez), ultimately forming one of America's oldest and most legendary law enforcement agencies - The Texas Rangers. From rough-hewn Rangers with guns on their hips to the legendary "Yellow Rose of Texas" (Addai-Robinson), whose brains were matched only by her beauty, this is a story of the human spirit rising in the face of insurmountable odds and claiming a piece of history for themselves. The Texas Rising Blu-ray and DVD are loaded with over 30 minutes of never-before-seen bonus material, including the "Capturing the Revolution: Filming Texas Rising" all-access featurette and two additional featurettes that look at the real lives of Sam Houston and Antonio López de Santa Anna, allowing viewers to go deep inside the thrilling historic events and behind-the-scenes of the creation of the epic mini-series. 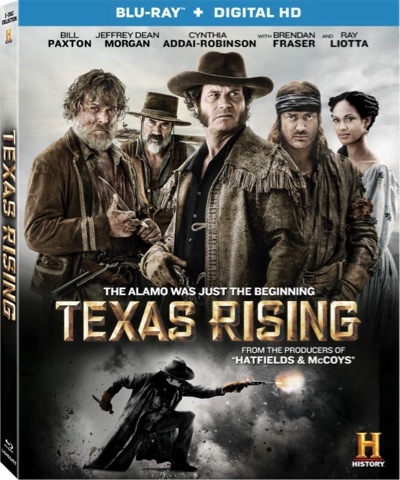 The Texas Rising Blu-ray and DVD will be available for $29.99 and $26.98 respectively.